People spend hours each day using electronic devices of all types. It may surprise some, but the use of computers and IPhones among the visually impaired has increased over the past two decades, just as their use among the general population has increased. Today, there are many apps that make life easier on people who have serious vision problems. Here are some of the best iPhone apps for the Visually Impaired . These days, it seems as if no one can navigate city streets without a GPS. However, Ariadane GPS does more than most GPS programs and devices. Using Google’s maps, this app can pinpoint a user’s location. It always orients the map so that the user is facing what is at the top of the iPhone’s screen. Also, when a user begins to cross a street, the app causes the iPhone device to vibrate. Color ID Free, as its name suggests, is a free app. Blind people can use Color ID Free to determine the color of just about anything (although it may have trouble distinguishing between blue and green contact lenses). The app uses the phone’s camera to take a picture, and then says what the main color of the picture is. Obviously, this is useful when picking out clothes, yet it can also be used to see if cheese is moldy. Blind users can rely on LookTel Money Reader to tell them what denomination a U.S. bill is. Unlike coins, dollar bills cannot be distinguished by size and feel. LookTel, however, can take a picture of them and know whether they are a one or a hundred. A simple, but useful app, Light Detector sounds a noise that is equal in volume to a light’s brightness. As a light becomes brighter, the sound becomes louder. This can help blind users identify lights that have been left on. This app is a basic text-to-speech software program. It will read anything on an iPhone’s screen out loud, including emails, Facebook pages, tweets and websites. Before investing in the full version, which costs $3.99, people should try out the lite version, which is free. Today, much of the internet revolves around instant messages: Twitter feeds, Facebook updates and email notifications, among other things. 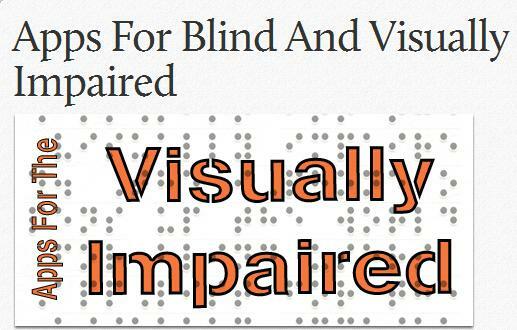 Blind people, unfortunately, cannot easily access these instant updates. HeyTell attempts to resolve that. It is an audio-based instant messaging system, similar to walkie-talkies. With OMoby, users can search by image rather than keyword. They can take a picture with the iPhone’s camera, and then OMoby will perform either a shopping or research search. OMoby is free. Apps are revolutionizing life for the blind and visually impaired. When contacts and glasses are incapable of curing a person’s vision, the iPhone’s camera becomes their virtual eye. Please do share some more useful apps. What according to you is the best iPhone app for visually impaired people? Jamie Lechler writes about eye ware for EZContactsUSA.com. These apps are available in Apple’s App Store.